Forty years after the oil shock Indonesia and the world are on the verge of another energy game changer. Last October marked the fortieth anniversary of the 1973 oil embargo that brought the world to its knees. The Organization of the Petroleum Exporting Countries (OPEC), led by Saudi Arabia, cut oil production and shipments to the United States and other countries that were supporting Israel in the Yom Kippur War. By March 1974, oil prices had quadrupled from around US$3 to $12 a barrel. “The oil crisis set off an upheaval in global politics and the world economy,” wrote renowned energy expert Daniel Yergin in the Wall Street Journal. After the shock, it was widely perceived that the era of cheap and plentiful oil was over and the world would have to live in an age of limitations. The sudden realization of the vulnerability of countries to wild fluctuations in oil prices has brought with it profound global changes. Through it all, the shifts have reshaped the fortunes and international position of Indonesia. Consider the differences between Indonesia in 1973 and the country today. 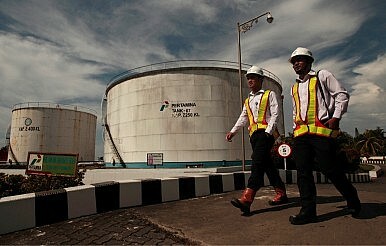 First, Indonesia has moved from exporter to importer of oil. Four decades ago, Indonesia produced more than a million barrels of oil per day, accounting for 60 percent of its exports, with oil revenues contributing about 70 percent to the state budget. The windfall spurred high economic growth into the early 1980s. But the boon also led to some unfortunate excesses: rampant corruption, political repression and fuel subsidies that distorted price and handicapped Indonesia’s finances. Now the 1970s daydream of an oil-rich Indonesia is confronting the realities of the 2010s – a painful process. The high economic growth rate and the artificially low price of fuel in Indonesia for the past forty years pushed domestic demand for oil to 1.5 million barrels a day in 2012, even as production has fallen from the heights of the 1970s, to about 850,000 barrels a day presently. To relieve the pressure on its finances, Indonesia is slowly weaning itself away from fossil-fuel subsidies – an unpopular and politically precarious move that Indonesia must continue to make. To meet its immediate domestic demand, Indonesia must continue to rely on imported oil, especially from the Middle East. But unconventional sources of oil and gas may present a promising option down the road. Second, the shale oil and gas revolution is a game changer. For many years, geologists have found huge quantities of shale oil and gas locked in shale-rock formations beneath the earth’s surface. But they were too expensive and technically too difficult to extract. Until now. Bryan Walsh wrote in Time magazine that two innovations made it economical to pump oil and gas out of the formations. Pioneering companies drill vertically down into the shale and horizontally through the rock while forcing millions of liters of water mixed with chemicals at high pressure to fracture the rock. This technique, known as “fracking,” unlocks the trapped oil and gas from the rock structures. From the “age of limitations” that began the 1970s, the promise of abundant shale oil and gas is transforming the world’s energy industry, economy, geopolitics and environment. A Wall Street Journal report says that the U.S. is overtaking Russia as the world’s largest producer of oil and gas. U.S. imports of natural gas and oil have fallen 32 percent and 15 percent, respectively, over the last five years. A PricewaterhouseCoopers analysis found that potential production from shale oil could reach up to 14 million barrels of oil per day by 2035, or about 12 percent of the world’s total oil supply. The technology to produce shale oil and gas is already being introduced elsewhere, including Indonesia. In the long term, the energy self-sufficiency of the U.S. and to a lesser extent of Indonesia and other countries as well as the possibility of Iranian oil and gas fields coming online for the world’s market – the latter helped by the recent thawing of U.S.-Iran relations – will increase global oil capacity, introduce changes in the geopolitical order and amplify the risk of upheaval in oil-export dependent countries. Another Indonesian Financial Crisis? Not Quite. Indonesia’s rupiah is nearing levels last seen in the Asian Financial Crisis. Here's why this time is different. Indonesia’s Booming Tourism IndustryWhat Indonesia's Natuna Gas MeansMasela: Indonesia’s Odd LNG PlanIndonesia's Biofuels PushWill Indonesia Get Serious on Carbon?